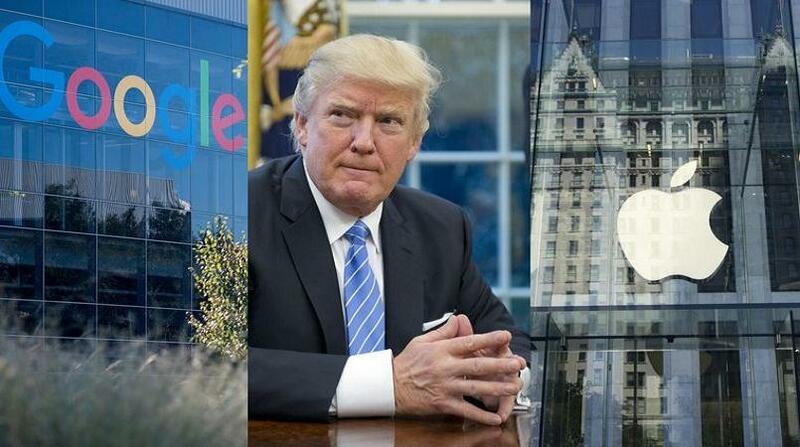 Apple, Google and Microsoft have joined a legal brief opposing US President Donald Trump's temporary travel ban, arguing it "inflicts significant harm on American business." The brief was signed by nearly 100 companies including Facebook, Twitter, Intel, eBay, Netflix and Uber, as well as non-tech companies such as Levi Strauss and Chobani. The document is an amicus brief, which allows parties not directly involved in a case but who feel they are affected by it, to give their view. Mr Trump's executive order, the most contentious policy move of his first two weeks in office, faces crucial legal hurdles. It had temporarily barred entry to the United States by people from seven mostly Muslim countries, as well as suspending the US refugee programme. A federal judge in Seattle on Friday blocked the move, and the Trump administration has a deadline on Monday (midday Tuesday NZT) to justify the action. US tech companies, which employ many foreign-born nationals, have been among the most vocal groups in speaking out against Mr Trump's travel order. The president has defended the temporary ban as necessary to ensure closer vetting of people coming into the country and better protect the country from the threat of terrorist attacks. Amazon.com and Expedia, both based in Washington state, supported the Seattle lawsuit, asserting that the travel restrictions harmed their businesses. Over the weekend, the 9th US Circuit Court of Appeals in San Francisco denied the Trump administration's request for an immediate stay of the federal judge's temporary restraining order that blocked nationwide the implementation of key parts of the travel ban. The government must now submit additional legal briefs to the appeals court in support of the executive order. Following that, the court is expected to act quickly, and a decision either way may ultimately result in the case reaching the US Supreme Court. Photo: AFP (US tech companies, which employ many foreign-born nationals, have been among the most vocal groups in opposition to the travel ban).